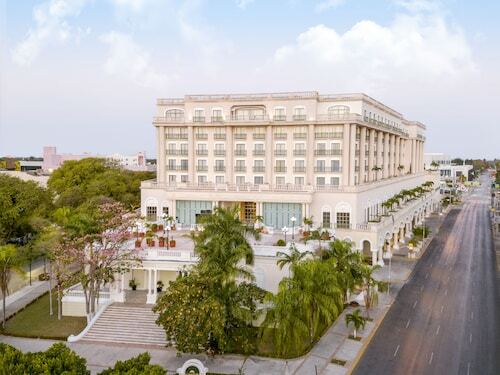 This family-friendly Mérida hotel is located on the Strip, within a 5-minute walk of Yucatan International Convention Center and U.S. Consulate Merida. Mérida Cathedral and Plaza Grande are also within 2 mi (3 km). This business-traveler hotel 13 blocks north of Merida's historical central square and cathedral, and faces fashionable Paseo Montejo boulevard and its colonial-style mansions. Gran Museo Maya is 3.6 miles (5.8 kilometers) away. 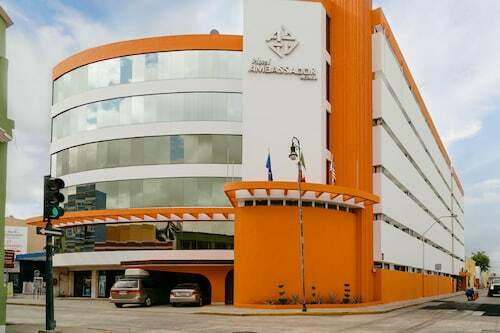 Located in Centro, this hotel is within a 10-minute walk of Santiago Park, Plaza Grande, and Mérida Cathedral. Paseo de Montejo and U.S. Consulate Merida are also within 2 mi (3 km). Located in Centro, this hotel is within a 15-minute walk of Paseo de Montejo and U.S. Consulate Merida. Plaza Grande and Mérida Cathedral are also within 1 mi (2 km). 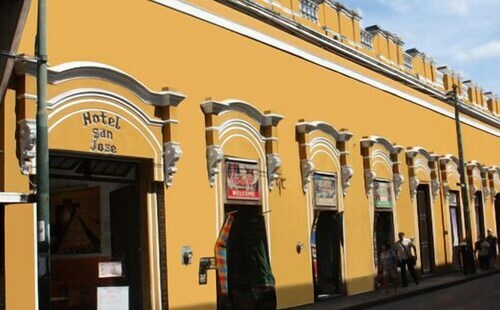 Located in Centro, this hotel is steps from Montejo House and Plaza Grande. Paseo de Montejo and Mérida Cathedral are also within 1 mi (2 km). 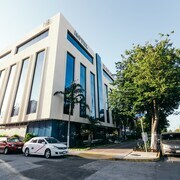 Located in Centro, this hotel is within a 10-minute walk of Jose Peon Contreras Theater, Paseo de Montejo, and Mérida Cathedral. Plaza Grande and U.S. Consulate Merida are also within 2 mi (3 km). 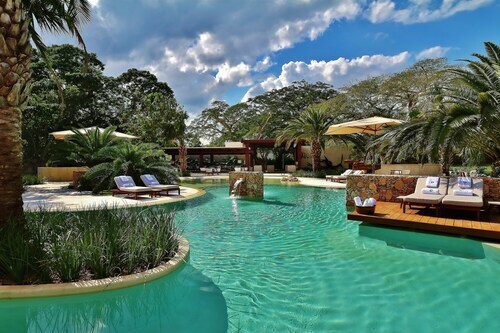 Situated in a national park, this hotel is within 1 mi (2 km) of Uxmal Archaeological Site and Pyramid of the Magician. Governors Palace is 1.6 mi (2.6 km) away. 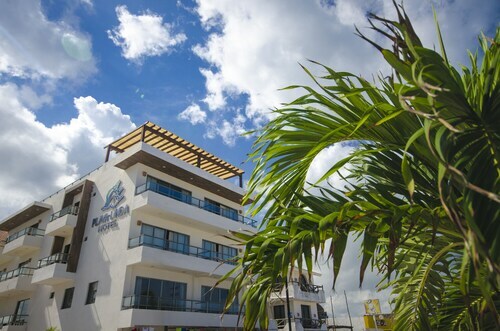 Situated near the airport, this hotel is within 3 mi (5 km) of Zoological Park of Centenario, Plaza Grande, and Mérida Cathedral. US Visa Applicant Service Center and Casa Frederick Catherwood are also within 3 mi (5 km). Located in Centro, this luxury hotel is steps from Hidalgo Park and Mérida Cathedral. Paseo de Montejo and Plaza Grande are also within 15 minutes. The Lodge At Uxmal is just outside the gate to the Uxmal Mayan ruins, the site of the Governor’s Palace. At the Pyramid of the Magician, only a few steps from the Lodge's front doors, guests will discover this amazing Mayan area. Mérida, the capital of Yucatan, is 80 km (50 mi) north. A 24-hour airport shuttle is available on request, surcharge applies. Located in Centro, this luxury hotel is within a 15-minute walk of Paseo de Montejo and U.S. Consulate Merida. Mérida Cathedral and Plaza Grande are also within 1 mi (2 km). Situated in a rural location, this luxury hotel is within 25 mi (40 km) of Hacienda Yaxcopoil, Calcehtok Caves, and Santiago Park. Zoological Park of Centenario and Santa Ana Park are also within 25 mi (40 km). How Much is a Hotel Room in Merida? Hotels in Merida start at $32 per night. Prices and availability subject to change. Additional terms may apply. 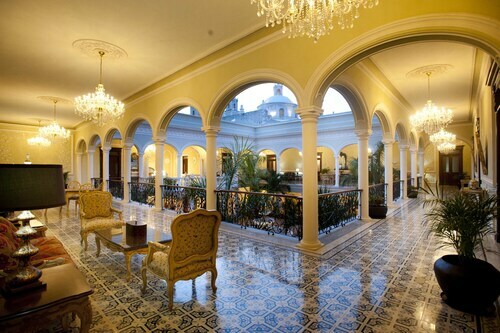 Inspiring hotel options are waiting for you in Merida. An impressive 87 accommodation options are available on Travelocity within a 6-mile (10-kilometer) radius from Merida's city center. 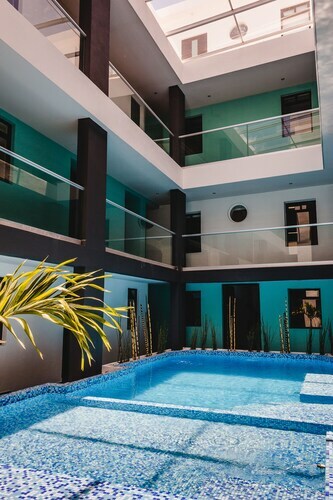 When you haven't got long in town, location is a priority when it comes to trouble-free travel, so read about the Casa Lecanda Boutique Hotel and Hotel Hacienda VIP, which are conveniently located within a 0.6-mile (1-kilometer) radius of Merida's urban center. 16 miles (26 kilometers) out from central Merida is Tixkokob, in which you'll easily be able to make a reservation at the Hacienda San Jose, A Luxury Collection Hotel, San Jose and Hotel Hacienda Ticum. Or else, the is nestled 45 miles (72 kilometers) from the main drag of Merida of the relaxed and convenient neighborhood of Celestun. Families, students and those watching their dollars will find some lovely Merida accommodation options that won't break the bank. 1 mile (2 kilometers) from Merida's heart you'll find the Hyatt Regency Merida Hotel. 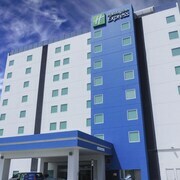 The Holiday Inn Merida Mexico is just 1 mile (2 kilometers) away. 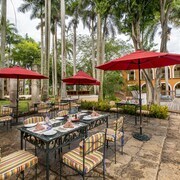 Additional budget room options include the Hacienda San Pedro Nohpat and the Gran Real Yucatan. Investigate the Hotel Casa Azul and the Rosas & Xocolate Boutique Hotel. 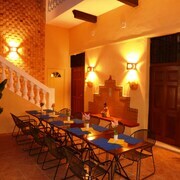 The Hotel Casa Azul is 1 mile (2 kilometers) outside of the main part of Merida. 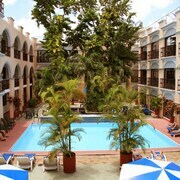 The Rosas & Xocolate Boutique Hotel, is only 0.9 miles (1.4 kilometers) away. 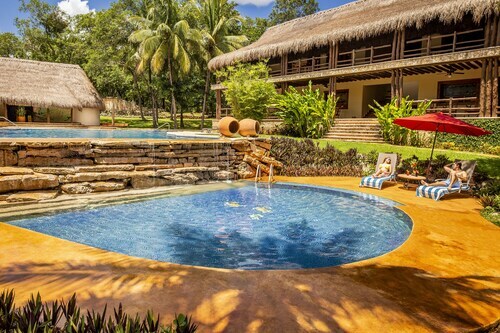 Other options include the The Hacienda Xcanatun and the Hacienda Tepich, Casa Vargas. Progreso is situated 40 miles (65 kilometers) to the south of Merida. While here, take the chance to explore the Uxmal Archaeological Site. 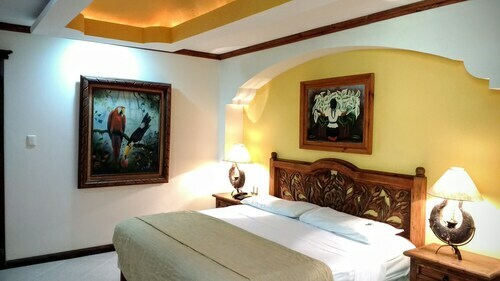 Uxmal Travelocity-listed rooms include the The Lodge At Uxmal and Hacienda Uxmal Plantation & Museum. Don't overlook Progreso, which is where you'll find the Progreso Lighthouse. Progreso is found 20 miles (34 kilometers) to the north of Merida. 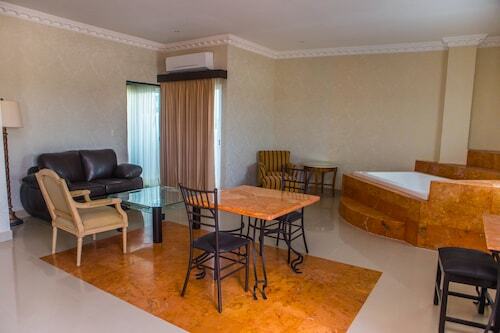 The Villas Yessenia and Hotel & Suites Domani are comfortable places to lay your head. When watching stadium sport is your passion, put aside some time for a trip to Estadio de Beisbol Kukulkan, which you will find 3 miles (4 kilometers) to the southeast of Merida. Wise travelers that need to find Travelocity-listed accommodation near to the sporting action will love the Hacienda Misné or the The Villa Merida Hotel. Manuel Crescencio Rejon International Airport is a primary gateway for flying into and leaving Merida. It is 3 miles (6 kilometers) away. For wise travelers who would prefer to find Travelocity-listed accommodation nearby, look into Koox Casa de las Palomas Boutique Hotel or Casa Lucia Hotel. Great location and views. Very clean and the staff was friendly. Amenities were few but unnecessary since the beach was so close. We had a great night. Liked everything. Nice room. Pretty, well-maintained grounds. Helpful staff. Good food. This Hotel did not honor my confirmed booking that has been charged on my credit card! They claimed they did not have our reservation and did not work with Travelocity! They also said they had no rooms available so we were left stranded on a Friday evening. I am a mother and disabled veteran and had travelled far to Merida on two auto-buses with my two children. We were left stranded! Later, after great stress and anxiety of trying to find a room available last minute in the city and finding none available... I had to pay for a very expensive taxi home to the beach and leave Merida all together. This was a disgraceful experience and I feel swindled and robbed. Beautiful hotel. Everything is brand new, and the staff were so friendly and helpful. The rooms are clean and comfortable, and have a mini fridge and coffee pot. Everything is well cared for. The grounds of the hotel include a lovely garden with hammocks and chairs, and there is a very nice pool, a bar, and live peacocks that live there and walk around. Be prepared for a little walk to Plaza Grande, it’s 10-15 minutes on foot. This hotel was an excellent value and a pleasure to stay in. I hope we’ll be back soon. The people who work at this Hotel take real pride in what they do servicing the guests, they will go out of their way to make you happy and cheerfully assist you in whatever request you have. I commend the great job from Cecilio, Braulio, Adalberto, Noe, The animation team: Edgar & Nicole, the DJ. On Saturday they brought a comedian and had a show in their auditorium and we had a great time enjoying. Will never forget the awesome treatment, interest and personalized attention to detail we enjoy from this hotel & their staff, will return again. Keep up the great job Reef Yucatan! 5 months ago by A verified traveler from Simi Valley CA.